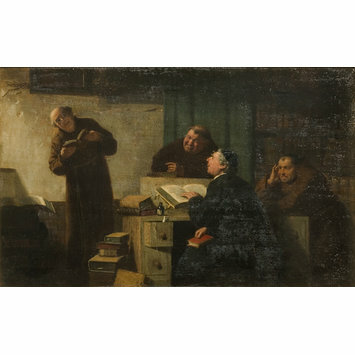 Oil on panel; In a monastic library three monks grouped around a desk make fun of a fourth monk who sways as he sings from a prayer book. Historical significance: Zimmermann painted a number of humerous genre scenes of monks. 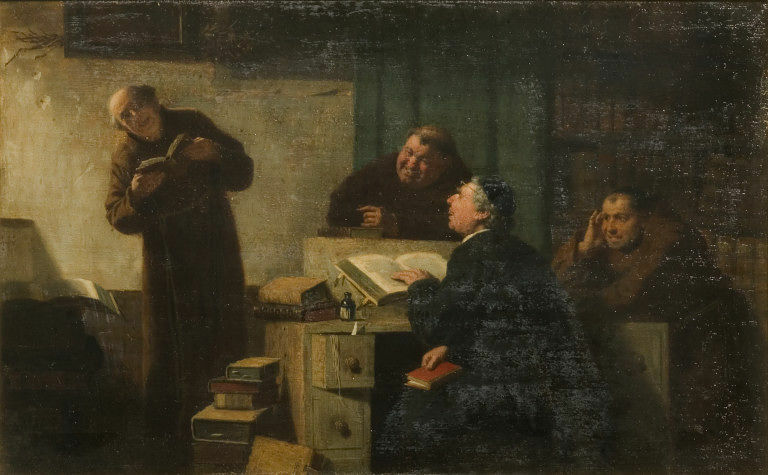 The seated figure at the lectern, and the desk with the open drawer and the string hanging from it, and the books on it and piled up next to it, all reappear in a painting titled Monk Smoking , dated 1876 (private collection); see Coseriu, Ricke-Immel, Tittel & Wieland, Der Genremaler Reinhard Sebastian Zimmermann 1815-1893 , Friedrichshafen 1986, pp. 46-7. Reinhard Sebastian Zimmermann (1815-93) was born at Hagnau on Lake Constance, and from 1840-1842 studied at the Munich academy, where his teachers included Schnorr von Carolsfeld, Heinrich Hess and Clemenz Zimmermann. After visiting Paris, London and Belgium (1845-46) and a brief residence in Hagnau amd Constance (1846-47) he settled in Munich. He became court painter to the Dukes of Baden-Württemberg and specialized in humerous genre scenes of Swabian and Bavarian subjects, especially figures grouped around a table. These reflect the influence of 17th century masters such as Adriaen van Ostade and David Teniers and the Scottish genre painter Sir David Wilkie (1785-1841), as well as recent German painters such as Carl Spitzweg (1808-85). Zimmermann sold works to a number of British clients, and in 1886 exhibited 8 works in Liverpool. Kauffmann, C.M. Catalogue of Foreign Paintings, II. 1800-1900 . London: Victoria and Albert Museum, 1973, p. 106, cat. no. 233. Maren Coseriu, Ute Ricke-Immel, Lutz Tittel & Georg Wieland, Der Genremaler Reinhard Sebastian Zimmermann 1815-1893 , exhibition catalogue, Staedtisches Bodensee-Museum, Verlag Robert Gessler, Friedrichshafen 1986, pp. 46-7, 176-7.